With two bachelors’ degrees from Northern Arizona University in hand – one in psychology and one in public relations – you would think that it would be easy for local resident Marshall Knauf to find a job. It wasn’t. But, following the old adage that when you are given lemons you make lemonade, Knauf decided to adapt. 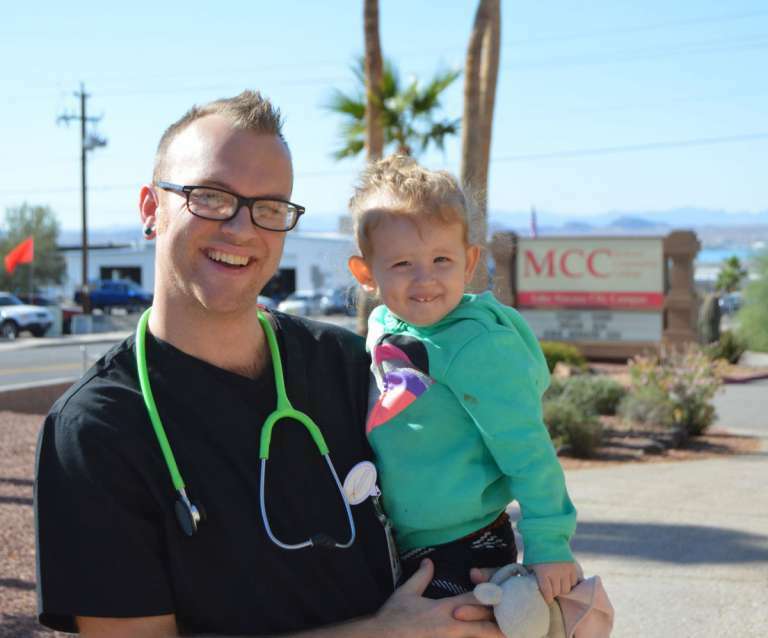 The 2005 Lake Havasu High School graduate is on the verge this month of earning a third degree from Mohave Community College and finding his true calling in life as a nurse. The sea change in careers began with a brief stint as a systems administrator and technology specialist while attending NAU. “I figured if people were going to call me at 3 a.m. as if it were an emergency because they couldn’t email someone I’d rather work somewhere that the emergency I responded to had a meaningful impact,” Knauf said. For Knauf, it was frustrating not finding a job in the career of his choice as a public relations professional in the video gaming industry – a job that also didn’t pay a decent wage – but coming to the realization that without previous job experience his bachelor’s degree was useless. While a pre-med student at NAU, Knauf soon realized he didn’t have the grit or wherewithal to make it through medical school. He noticed how fulfilled his wife Maegan was as a nurse and made a 180 degree turn. Knauf recently started his journey in medicine as an emergency room technician at the La Paz Regional Hospital. His ultimate five year plan is to work in a pediatric hospital in a leadership role.